In the Destinations category you will find proposals of escapement from the everyday routine, destinations that can everyone combine with the visit and his stay in the Kourouta beach. Localities with rich natural beauty and archaeological spaces of great historical value will compensate you absolutely in winter - summertime. 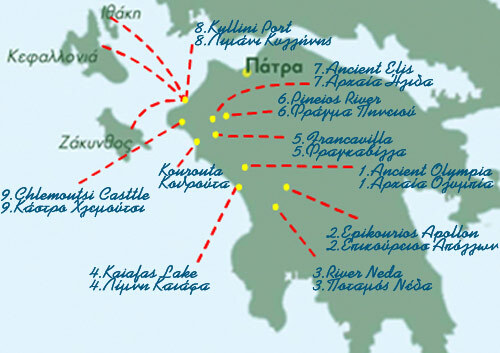 For analytic information we request you select the destinations that you are interested in from the map that follows or watch the satellite photographs from the rivers, the lakes, the forests and the archaeological spaces that surround the Kourouta beach Amaliada. For more detailed information about each destination please click on the map.